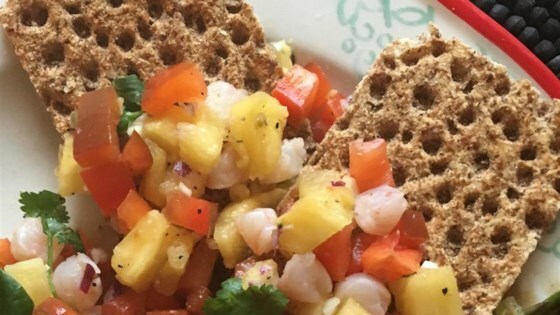 "The start of summer means lighter meals, and ceviche is delicious, and quick to prepare. This is great served on a bed of lettuce or in a martini glass, with tortilla chips or wonton crisps for dipping." Stir the shrimp, bell pepper, pineapple, avocado, onion, cilantro, garlic, serrano pepper, lime juice, salt, and pepper together in a glass or ceramic mixing bowl until evenly combined. Cover, and refrigerate 1 hour before serving. To prepare wonton crisps - lay packaged wontons in a single layer on a baking sheet, spray lightly with cooking spray and sprinkle with salt. Bake at 375 degrees F (180 degrees C) approximately 10 minutes, until lightly browned. I love this recipe! Being a pescotarian its hard to find good recipes. Although i would add a little bit of lemon juice, too. thank u for this recipe!!! Try with adding some lemon as well to see taste. Absolutely delicious~ I brought this to an appetizer party and served it with scoops chips and it was a huge success. I did use more limes and added imitation crab to the recipe. Very light and refreshing. Perfect for Summer or just to keep it light. Loved the Pinapple addition!